While it’s not without its limitations (and expensive to boot), the final results here tally up to a product that’s often deceptively compelling but falls short of a must-have. 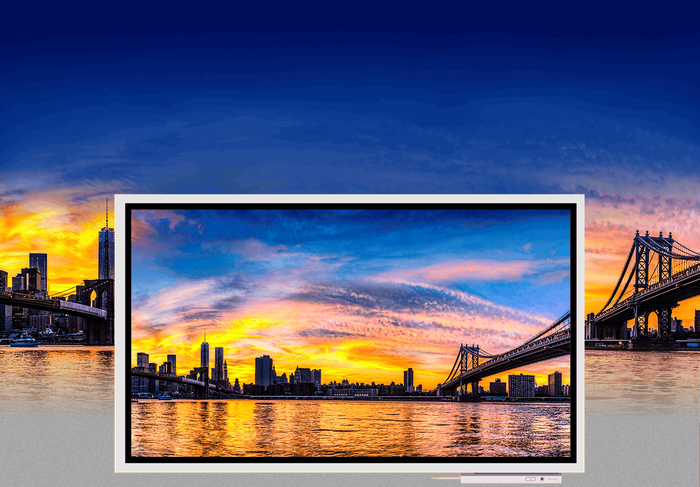 Between the Sharp Huddleboard, Google’s Jamboard and, now, the Samsung Fl!p, it’s clear that the titans of consumer electronics are keen to cash in on the need of modern businesses for solid and reliable digital collaboration devices. 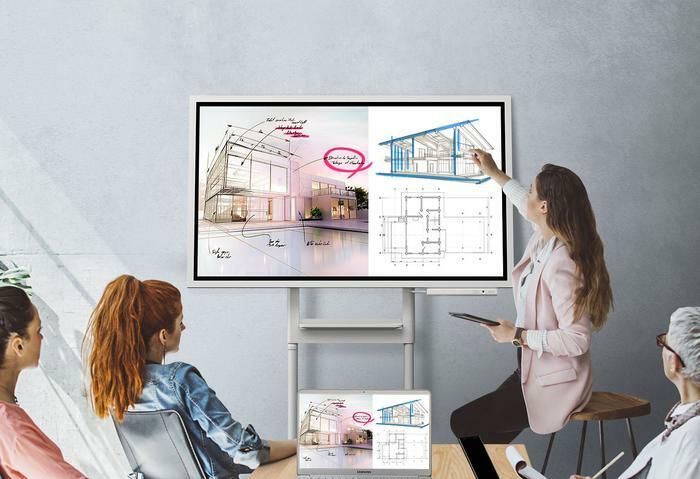 The key here is that, rather than just sell an upsized Windows 10 tablet with a multi-touch screen and a 4K resolution, the Samsung Fl!p genuinely tries to deliver on that concept of a digital whiteboard from the ground up. While it’s not without its limitations (and expensive to boot), the final results here tally up to a product that’s often deceptively compelling but falls short of a must-have. At least, for the time being. The Samsung Fl!p looks like a frenzied hybrid of whiteboard, flipchart and big-screen TV. It rolls around on a four-legged stand and - once you’ve gone through the pain of the somewhat-convoluted assembly process - can be easily changed between vertical and horizontal screen orientations.Regardless of which way you set the Fl!p up, the display itself is slightly tilted away from the user, which helps make writing on it a little easier than it would be otherwise. From there, the Tizen-powered smart display is about as intuitive to use as the Samsung Notes app on your latest Samsung Galaxy or Note smartphone - albeit a little less capable. Still, there’s definitely a sense that the design of user interface for the Fl!p has been come from much the same place. Apart from the a matching set of import and export keys up the top, the Samsung Fl!p does its best to veer as close to that traditional whiteboard experience as possible. Samsung have chose to occlude any sort of proprietary stylus accessory here. Touching the Fl!p’s display with an object the size of a pen will let you write on it. Touching the display with something a little larger, like a finger, will act as a highlighter. Touching the display with anything larger than that will act as an eraser - letting you wipe away mistakes with ease. During the time we've had the Fl!p set up in our offices, plenty of passersby have walked over and almost immediately been able to get stuck into using it without too much fuss. 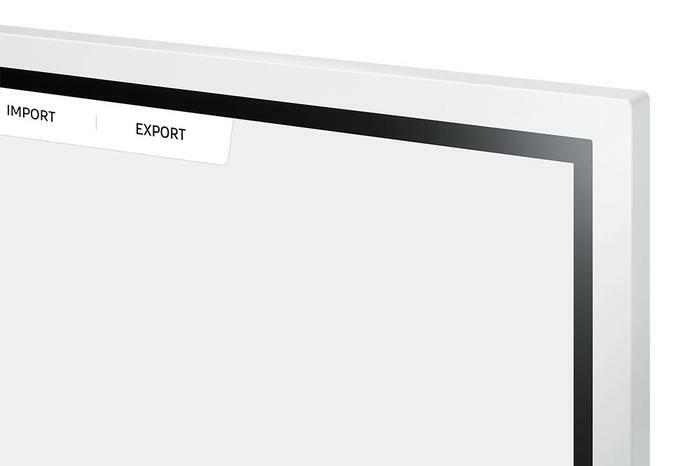 It’s designed to mimic that whiteboard feel and while I wouldn’t say it feels 1:1, it certainly gets a lot closer to that ideal than a lot of the competition. Helpfully, it also leverages the digital-nature of the thing to transcend the limits of a traditional whiteboard where convenient. Run out of space on the screen and you simply pull the page over to expand it. You can import images (PDF, TIF or JPEG) and even share-screen content by simply tapping your phone to the NFC sensor on the Fl!p. There's no shortage of neat things you can do with the Flip. But that's not to say there's no room for improvement. Given how compelling of a package the Samsung Notes app on the Galaxy Note 8 is, I wouldn’t mind seeing more features from that make there way in here. There’s a conspicuous lack of a screen or audio recording function - and the limitations on compatible formats are also a bit of a pain. Given that Samsung have the capability to add new software features or support over time, I hope that they make use of it to address these shortcomings. Thankfully, Samsung are already starting doing this. Since the Fl!p launched, a major update has already added the ability to open documents from Microsoft Office including PowerPoint, Word and PDF files, full-screen synchronization with Android Oreo devices via NFC and improved LDAP functionality to allow for easy sharing of company user databases directly to the Fl!p. As someone who mostly covers consumer products than anything like this, I actually wouldn’t mind seeing a more smaller, more compact and affordable version of this product that’s slightly-larger than the Galaxy Note or Tab S but still relies on Samsung’s S-Pen. A variant with a built-in webcam or microphone wouldn’t go stray either. If you’re the kind of productivity-focused or collaboration-heavy enterprise customer who is looking at buying something like this, the Samsung Fl!p holds up as a compelling option - assuming you’re willing to trade the extra functionality that native Windows would provide for the more-specialized limitations that Samsung have implemented here.